Quick and easy Father's Day Card. 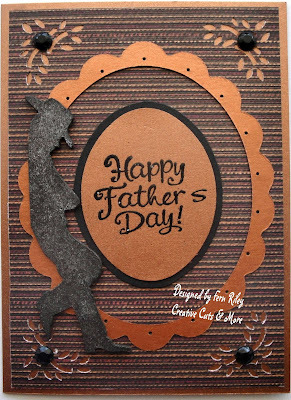 Hi everyone, Fern here with a Father's Day Card I made using the A2 Card and Large Scallop Oval Frame #2, both in the Copper - Stardream Metallics from Creative Cuts & More.. 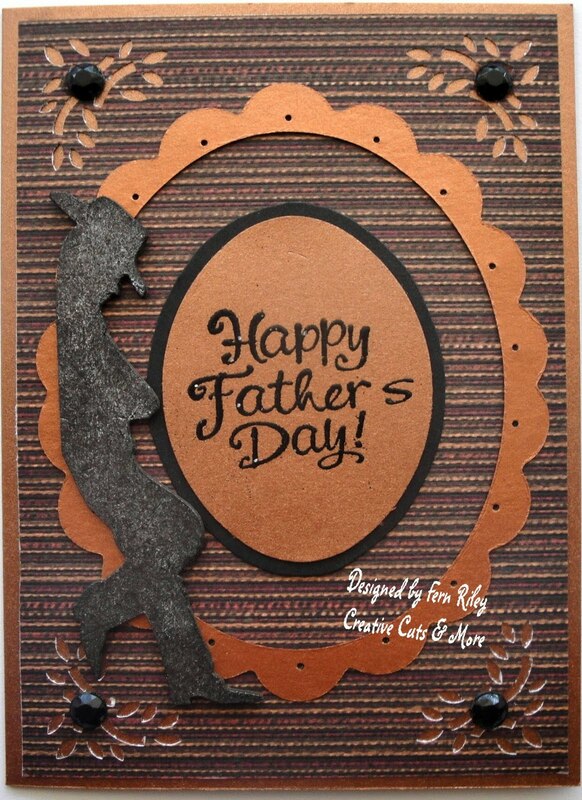 The colors are perfect for the masculine look I was looking for on my Dad's card.. I found this perfect "man" paper in my scraps and punched the corners with a decorative punch so that the beautiful copper color would show through.. Then I layered it over the A2 Card front, and added a black jewel in each corner... 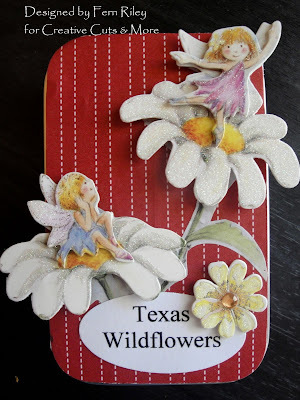 The chipboard Cowboy is from Heart of Texas Studio and sprayed with Glimmer Mist. 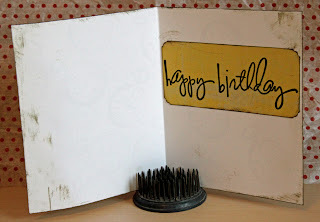 The sentiment is from SU and stamped with VersaMark and then embossed with black embossing powder.. I used my paper piercing tool to punch a tiny hole in each of the scallops around the Large Scallop Oval Frame.. Everything is held together with Killer Red Tacky Tape!! It's quick and easy when you have most of it already cut and scored for you... All you have to do is personalize it!! I hope that maybe I've inspired you to go check out Creative Cuts & More... And while you're there check out the beautiful assortment of butterflies Terry has put together for you!! I was so excited that I could finally use some pictures of my son's wedding day. Wanted to share a couple views of some of the pictures of my son and I on that special day. Did you know there are several frames available at Creative Cuts and More store? 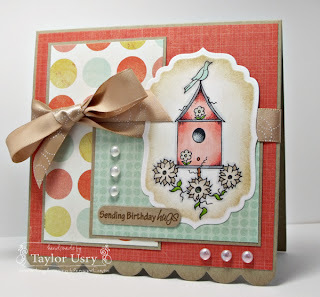 Hi, Dawn Lusk here and today I'm sharing a Circle Window A2 Card with Mat from Creative Cuts and More! The card base is Neenah Smooth and the mat is Bazzill Canvas Flamingo, I just love that canvas texture! I stamped the Dahlia (coming soon from Our Daily Bread designs) inside then 3 more times. It is colored with Copics and Prismacolor pencils blended with baby oil. I then cut the extra flowers apart, shaping the petals and popped them up. The quote is also from ODBD, soon to be released. Then I just added a lot of foliage and a bow. I hope I've inspired you to try one of these Circle Window cards, sure makes creating easy!! Hi! It's Nora Anne posting today! 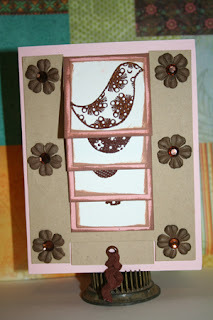 I just love these Oval Window A2 Cards with mat, so many different possibilities. And Creative Cuts & More has every color you can think of! I had a busy week and was able to whip this beauty up in no time thanks to the pre-cut and scored card and pre-cut mat. That's the wonderful thing about Creative Cuts & More! 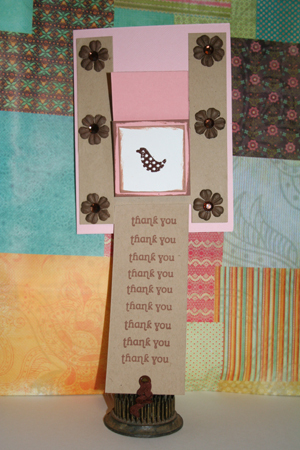 There are so many die cuts that help make gorgeous projects in no time at all! Thanks for coming by today! 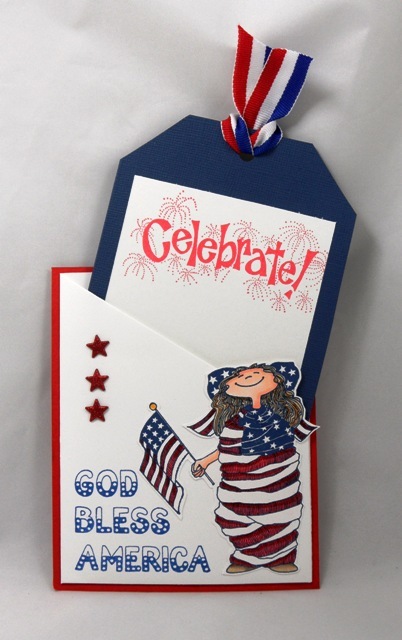 Be sure to check out the full variety of cards available at Creative Cuts & More! HAPPY SHOPPING! Do you still send Thank You cards? 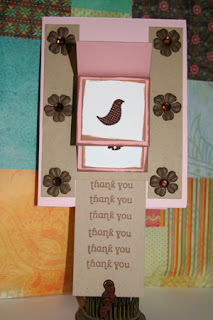 ﻿I remember as a child my Mom wouldn't let me spend my Birthday money until the thank you card was in the mail! As an adult I still send Thank You cards all the time. 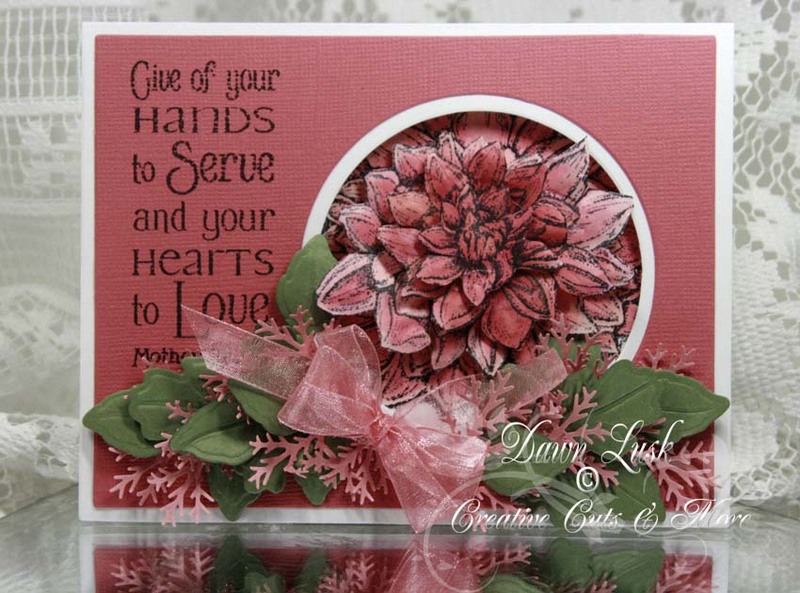 Creative Cuts has so many cards to choose from it makes it extra easy! This card is an A2 Card. I love that you can keep it simple or dress it up. The stamp is an itty bitty by Unity. The ribbon is by Creative Impressions. 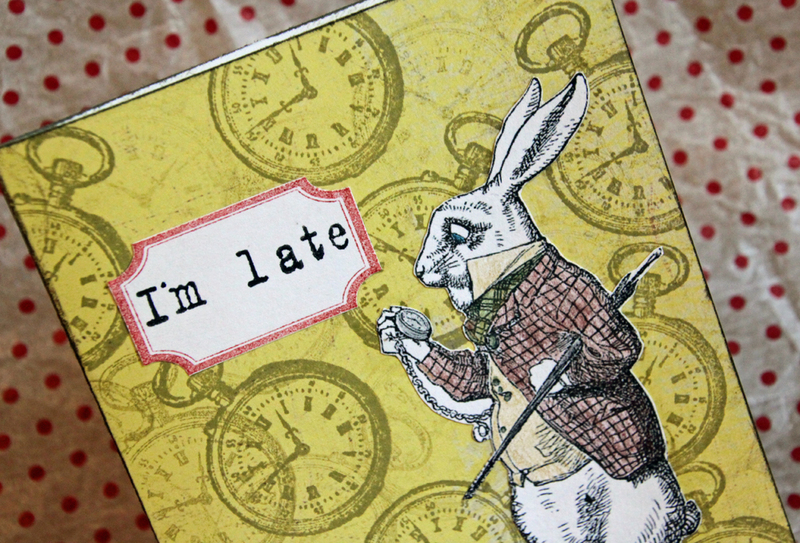 I ordered the card in white, but covered the front in a yellow-toned cardstock & then stamped the pocket watch image all over it in a Brushed Corduroy Distress Ink. 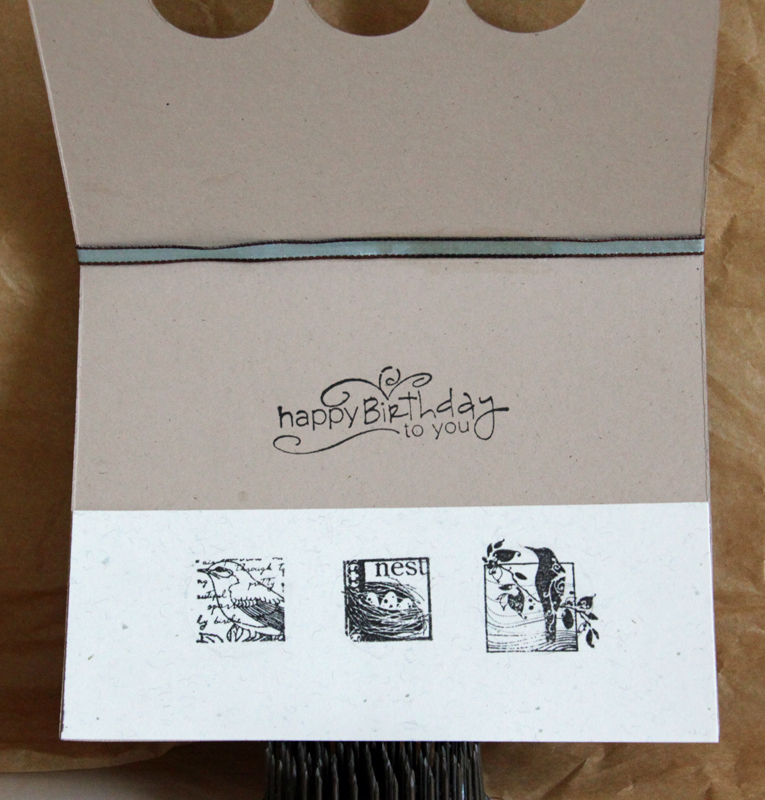 The label is another stamp I ordered from Red Lead Paper Works, but these labels from CC&M would work great too! 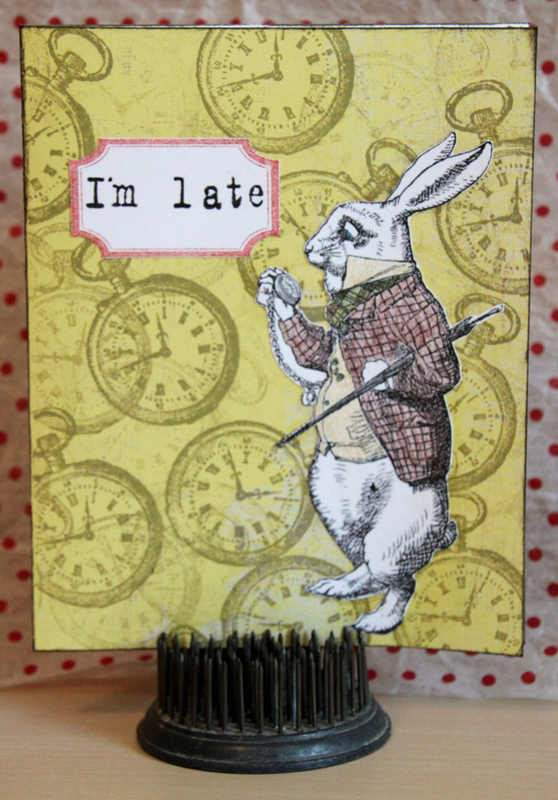 The Alice in Wonderland Rabbit image I printed from the Net, cut it out & colored it it w/pencils. for all the wonderful card & dies assortments!!! When you were little did you ever win a goldfish at the carnival? This card reminds me of that time. I got this fun fishbowl shape card from Creative Cuts and More- It was a solid shape and I cut out a circle in both sides. I then took a couple pieces of plastic from packaging and cut circles. Those circles were embossed with a bubbles folder. Doesn't that look great on that plastic? I found this free image on-line at Google pictures- it was the most realistic goldfish. I printed and flipped the image and backed them together. All I used was some Killer red tacky tape to seal the sides and a small bow for the top. Such a quick idea and fun design to use. 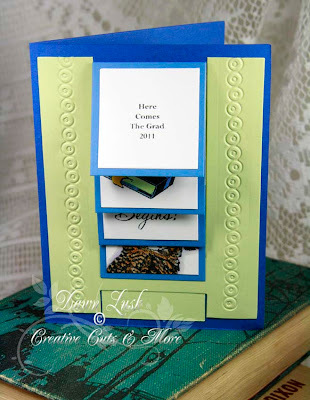 Did you know Creative Cuts and More carries many shape cards that you can decorate or alter? Anyone that knows me- knows I love my purses! 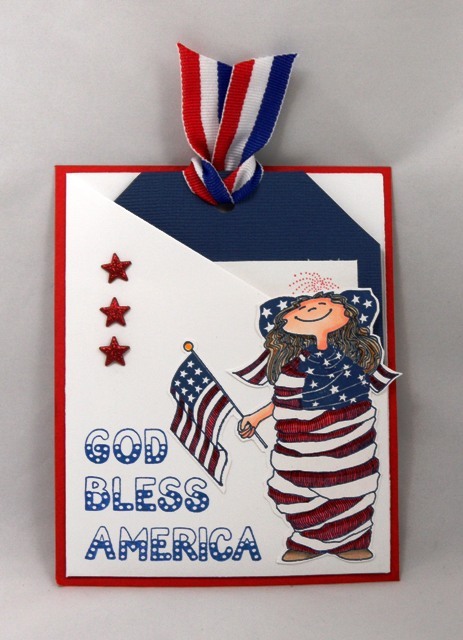 I seen this die cut at Creative Cuts and More and knew I needed to make for a friend as a gift and decorations. I know she will save it! I used this patterned design from my stash and cut it in half and attached to the front and back. I then decided it needed some glitter!!! Used a favorite glue of mine and added a clear iridescent kind. I loved the ball chain handle- how realistic does this look? After using Tearable Killer White Tape to attach the lining and clasps. I decided to only close the bottom a little so I can put maybe a small gift: a gift certificate,a favorite lipstick or lip gloss. Is there anything else you would think would work in this cutie? Here's another fabulous card from my "Crazy Bird Lady-Sister," a.k.a. Kim! She used the Circle Border Window A2 card turned horizontally, in kraft & added all the little birdy stamps & papers & the perfect ribbon across the top! 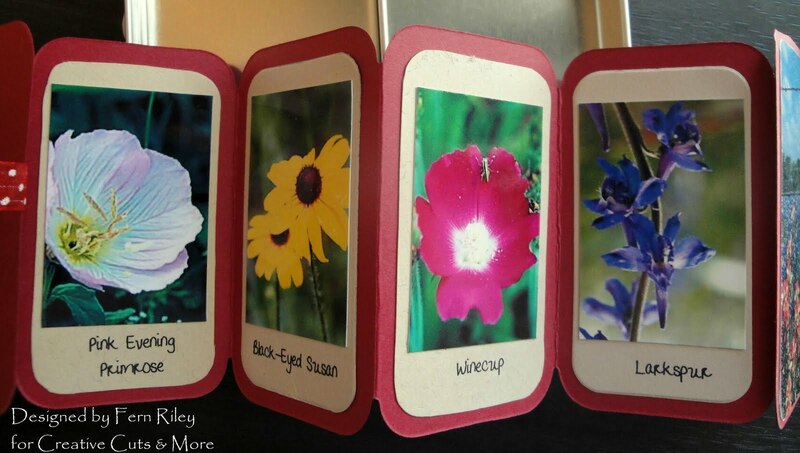 Terry has lost of card assortments available in the store, so be sure to check out all she has to offer! Hi, it's Nora Anne here today sharing a little mini Coaster Art with you! Creative Cuts and More sells square and round Coasters in packs of 10. They are awesome to have on hand for cute little mini albums and home decor items! I made this inspirational art for my cousin. She just found out she is being laid off after 11 years at her job. 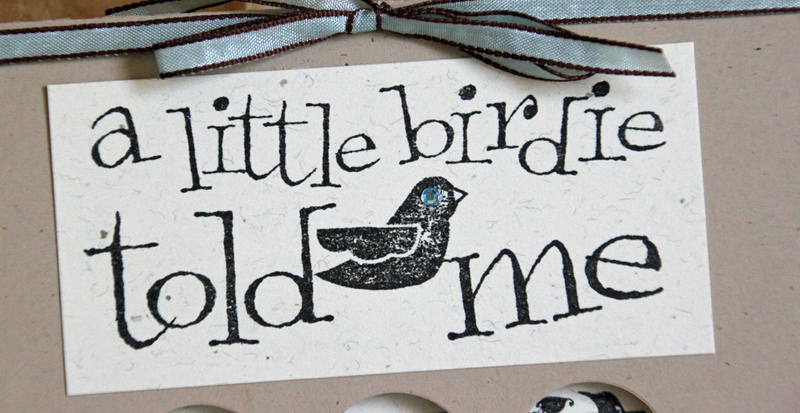 This quote was the perfect sentiment for her and the coasters were the perfect foundation for this piece. I inked the background of the coaster with Ranger Distress inks, then sprayed with Glimmer Mist. You can't tell in the picture but it's super shiny and shimmery and beautiful in real life! Wanna know the coolest thing about these coasters?! You can die cut them and make your own chipboard shapes ~ another great reason to keep extras on hand! 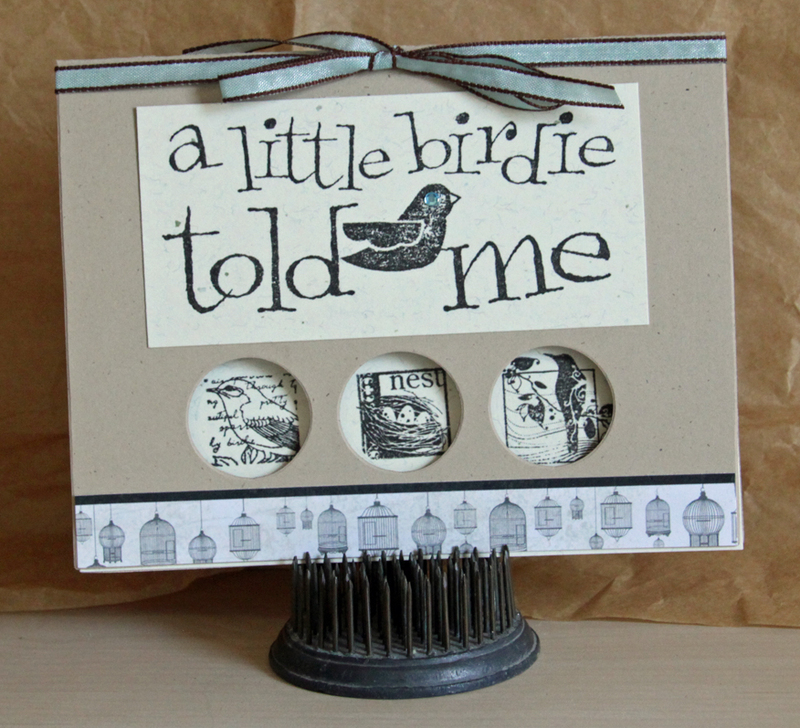 The cute little bird is die cut from a Tim Holtz die, then inked, misted and stickled up! Thanks for visiting today, leave a message and let me know if you like my Coaster! Some times I like to put Bling on the holes. This time I just left it blank. The stamp is an itty bitty by Unity. The ribbon is from Hobby Lobby and those little round things are from a pink swap I did many, many years ago and they are those little things that seal envelopes. They have hearts stamped into them. 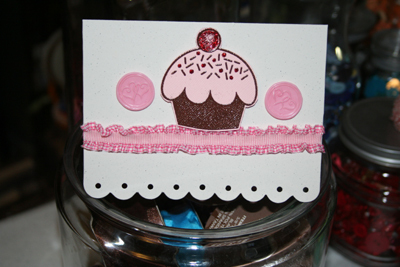 I used Stickles to decorate the cupcake. Hi everyone! It's Taylor, back again today with another fun card. 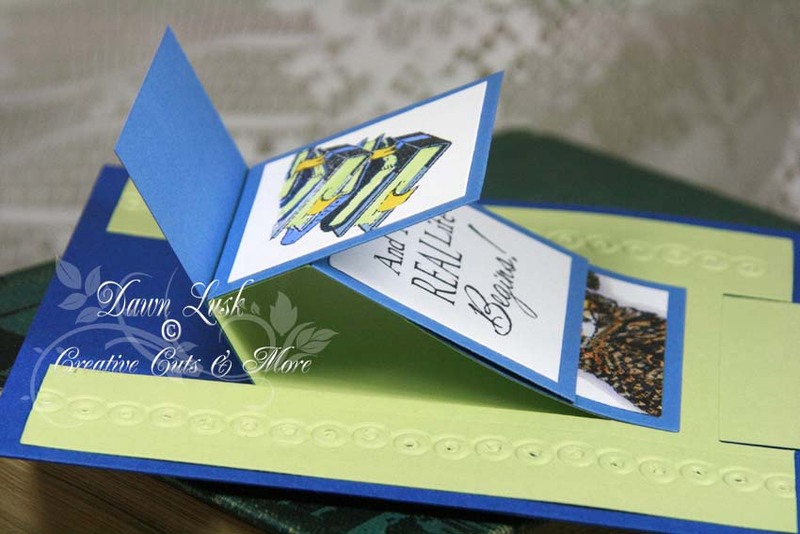 I used the 5 1/4" Square Scallop Card in Kraft (Bazill Classic Smooth) for my card base - these just make creating so easy! All you have to do is fold along the pre-scored fold line (I always use a bone folder for that, to get a good sharp crease) and add your patterned paper, image, and embellishments. Did you know Creative Cuts and More has a huge selection of pre-scored card bases to chose from? They also have several different assortments you can purchase - those are perfect for making a set of cards for yourself or someone else! Welcome to Monday everyone! 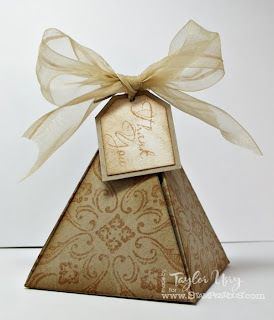 It's Taylor here today, and I'm sharing a fun (and quick) little treat box I whipped up. I started with the Pyramid Box, in Bazzill Kraft. I stamped a large medallion from Stampendous on each side, and lightly sponged each edge. I was going for a vintage yet masculine feel. How'd I do? Now, in theory, you should use the spectacular Killer Red Tacky Tape to assemble this box. 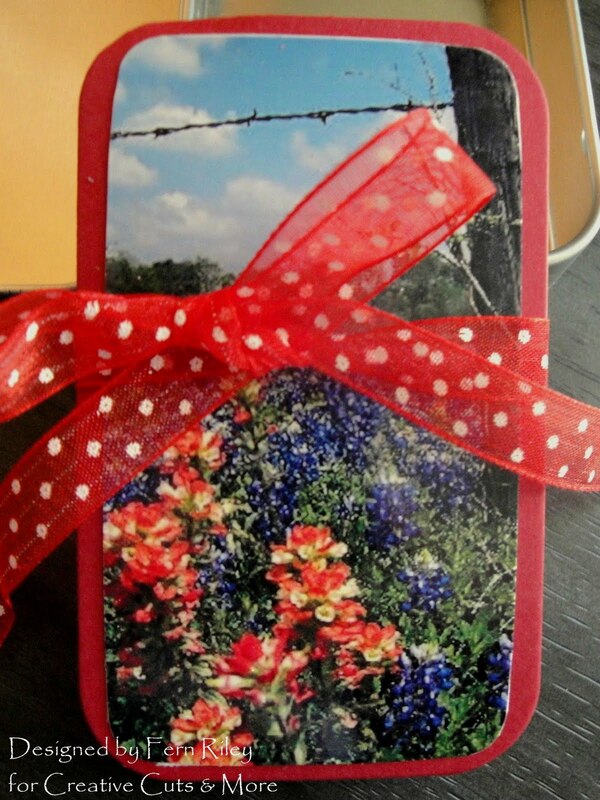 But I chose to not add any adhesive at all, and just tied mine together at the top with twine and pretty ribbon. That way, when the recipient unties it, it sort of falls open to reveal the fun chocolate surprise I have hidden inside! Have an excellent Monday, and I'll se you back here tomorrow! 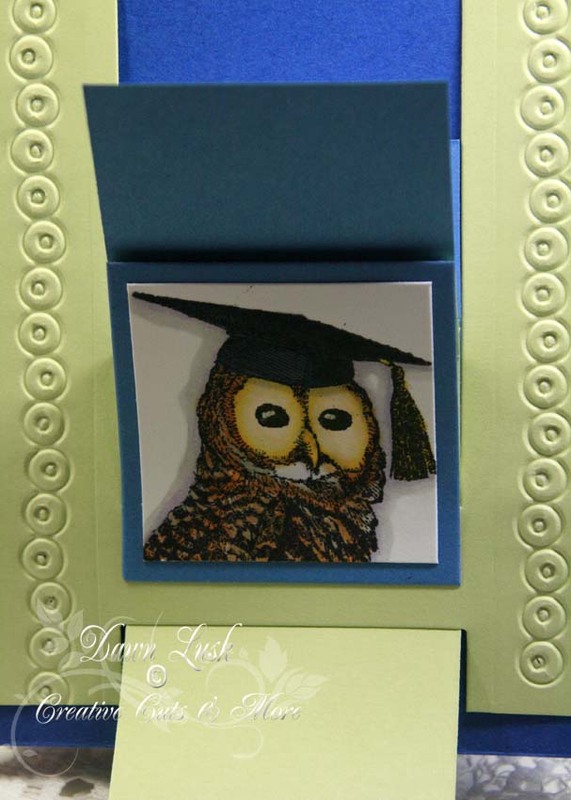 Dawn Lusk here sharing this Waterfall graduation card from Creative Cuts and More. 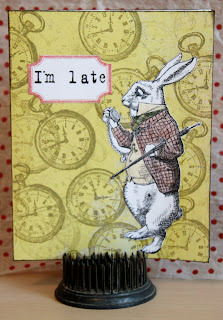 I don't know about you, but there seems to be quite a few graduating and I'm busy making lots of cards! Having pre-cut and scored cardstock is such a help when I'm mass producing or in a hurry!! This is Bazzill and Neenah cardstock from Creative Cuts and More in Huckleberry Pie, Pear Crush, Loganberry Pie and White... makes you hungry doesn't it!! It's so easy to put together too! I used Killer White Tear-able Tape to adhere the mechanism to the base and the squares to the mechanism. I dry embossed the edges with Cuttlebug border, Frills. 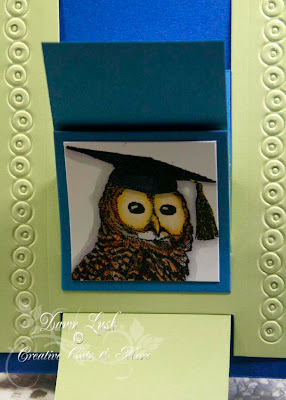 A fun graduation card! All images are from Mark's Finest Papers, Here Comes The Grad, and colored with Copics. 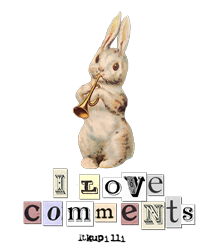 Hi, it's Nora Anne posting today! Did you know that Creative Cuts & More carries velvet paper?! I made a fun card this week using the Bubble Gum and it is SO beautiful! So be sure to swing by Creative Cuts & More and pick up some today! And join me in wishing Noelle a Happy Belated Birthday! Have you tried a Waterfall Card? I have been on the Creative Cuts design team for about a year and a half! I have avoided this Waterfall Set Card like the plaque! WHY?? It looks HARD! Let me tell you what! It is NOT hard! It is easy as pie! It is my new favorite card! I'm afraid Terry is going to tell me ENOUGH of the waterfall card Noelle! You will need some Killer Red or Killer White Tear-able Tape! As you pull it out and the squares flip, you will want them to stay put! The bird stamps are from Unity Togetherness Icons. The Thank You I rescued from the trash. *shudder* my BFF throws away stamp wrappers and these stamps! 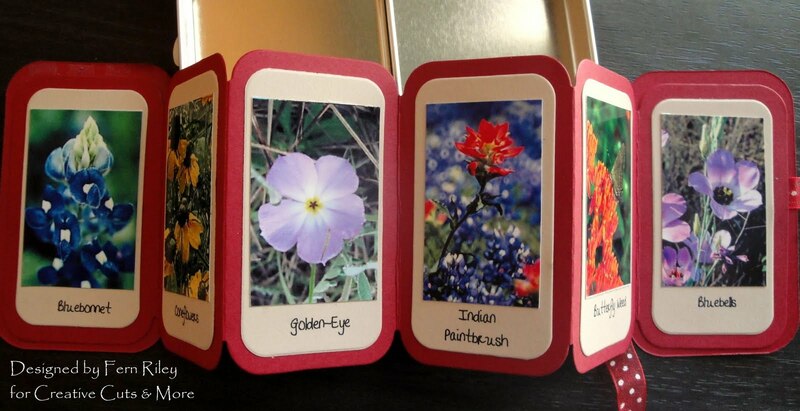 The Flowers are Prima, the gems are Studio G. The EP is American Crafts Brownie. ﻿Here is a side view so you can see how it flips when you pull the ric-rac which is My Mind's Eye from the Brown Lush collection! Hi everyone! 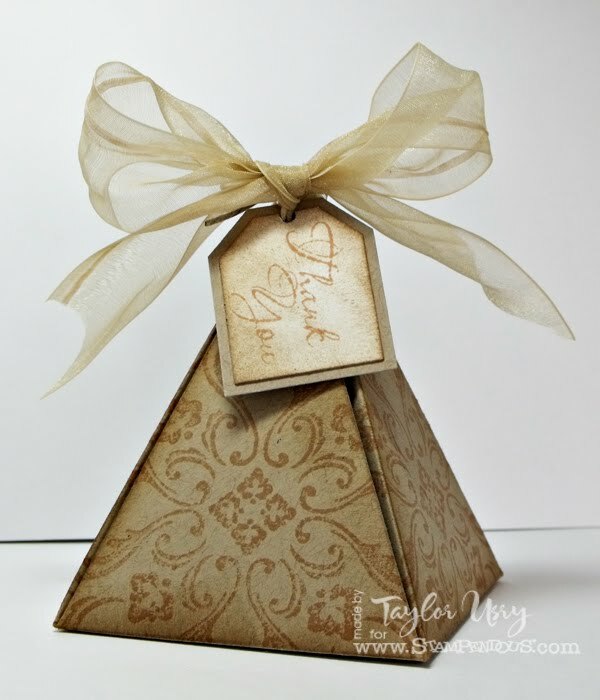 Taylor here, and today I'm sharing a fun and simple card I made using the Dress Window Square Scallop card. 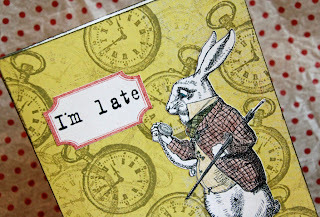 I think this card is fabulous for all sorts of fun, girlie things - invites, thank you notes, gift sets, you name it! I chose to add a piece of patterned paper behind the dress, bling across the top, and a pretty bow. What else does a girl need? I hope you have a terrific day, and thanks for stopping by! I have another gift card card to share today. 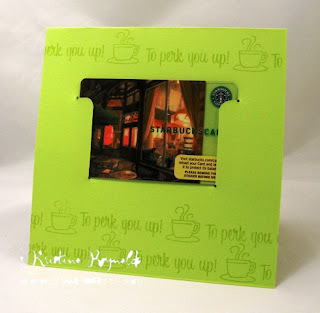 I love these die cut cards and try to keep a few on hand all the time because it's so quick and easy to decorate one when I need a way to present a gift card to someone. 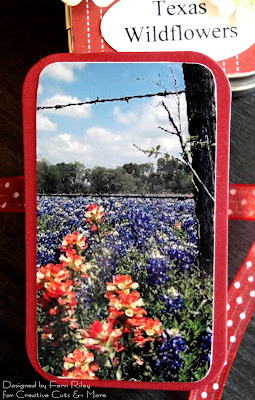 I started out with a die cut Gift Card Holder Square Scallop Card from Creative Cuts & More and decorated it with images from From The Kitchen clear stamps by Stampendous. Hope your week is off to a great start! Thanks for starting it off with us! Don't we all have some days when we want to be a princess? from Creative Cuts and More Store is just so so fun to play with. 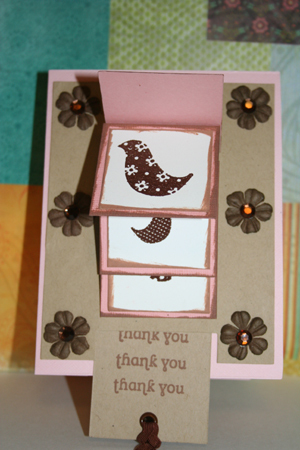 I chose a very soft pink in Bazzill papers and it worked perfectly with the supplies I used. You know you can pick any type paper, texture or color for your favorite die cut. Hope you enjoy my album. Here is the front page with a sample picture of a couple princesses. I embossed the side columns so they looked like brick. A little fur and pearls and fun ribbon. The second page with some fun patterned paper to go with the fun theme . That pink gathered pink and ric rac just seemed to work. Now I know I needed to have a page where I could write a story - ONCE UPON A TIME. 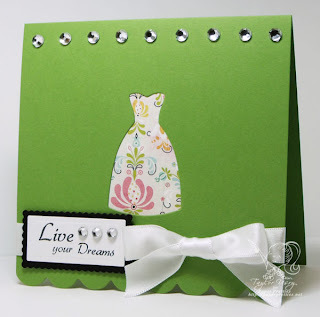 I embossed this coordinating paper and added the ric rac and ribbon. The last page was just fun as can be- no princess is complete with out a magic wands that can be detached. So what do you think of my album fit for a princess? 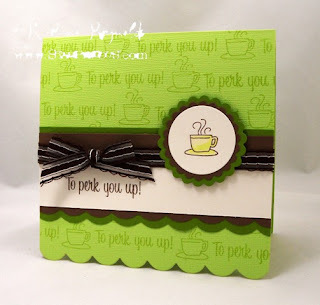 Hello everyone, Fern here and today I have a little Rectangle Accordion Mini Album with Layers & Tin Set from Creative Cuts & More that I want to show you.. 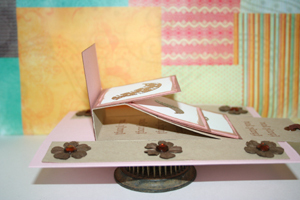 I am using the Pomegranate Splash Bazzill Smoothies Cardstock for the mini album and the layers are in Almond Cream Bazzill Smoothies Cardstock. Here's the front cover, remember it's for a 5 1/2 year old!! I covered it with some scrap paper and added a 3-D sticker of the little fairies sitting on flowers. I printed the title off of the computer and punched it out with the SU small oval punch..
All pictures were printed off of the computer.. I just know Savannah will loooove this... I hope you enjoyed looking at it as well!! 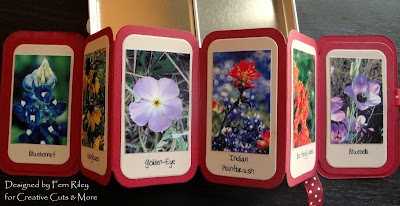 These little mini albums come in so many different colors and you can get the layers in any color also.. They make wonderful little gifts, and you know the end of school is approaching fast... This would make a perfect gift for any Teacher. Go check them out over at Creative Cuts & More and while you're there be sure and check out the new die cuts Terry is adding daily... If you find something you like, be sure and let Terry know that I sent you and please use Code CC&M10Fern..